These pictures were taken on 27 June, 2006 near down town in Tallinn. This memorial has been highly controversial. Just a day or two before these photos were taken there had been protests and vandalism, so the memorial was chordoned off. 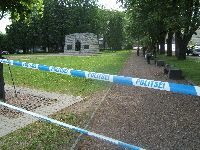 I was not allowed to approach the memorial, so the close up pictures were taken by one of the police guards. 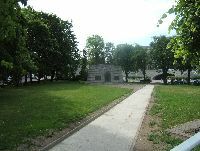 This monument originally had an eternal flame in front of it. You can read about the constroversy in this New York Times article. bronze-soldier.com/ is a resource set up by those who still defend the memorial. The plaques read, left in Estonian, right in Russian, "To those who fell in the Second World War". This text has been changed since the fall of communism. 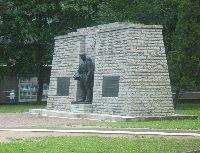 Soviet monuments would undoubtedly use other language, including calling the war the "Great Patriotic War" instead of World War Two. 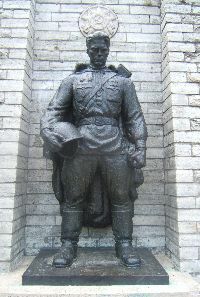 This is a typical memorial depiction of a Red Army soldier.